I have a great friend, Trish, who has been a mentor to me for the past 30 years. She is in the residential ownership and management business, and has been a great insight into the changes happening in that sector. Which is why I’m not surprised by the below article, and the size of the companies now involved in buying homes. Institutional investors have entered the residential housing market for the first time since the recession. Big sums of investor money flooding the market has created competitive buying conditions for both families and investors. Families that are not able to pay elevated prices in inflated areas are obligated to pay higher rental rates. Investors are not only building equity, they are exceeding their monthly mortgage obligations in rental income. When $40 billion and 200,000 homes are bought by investors (not users), and the buyers are Wall Street notables like Colony Starwood—Blackstone, Goldman Sachs, etc., it’s a sure sign the market is changing. While this is only 2 percent of the overall market, that is enough to move the market—increasing prices now when there is more demand than supply and holding prices down when these giants decide to sell (and they will). Keep your eyes on this trend, and call me if you want to discuss. 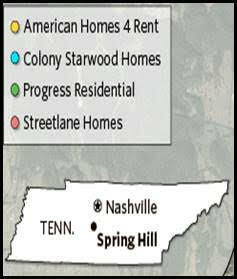 Big investment firms began buying single-family homes in Spring Hill, Tenn., in 2012 and offering them for rent. Four firms now own about 5% of the houses in town. SPRING HILL, Tenn.—When real-estate agent Don Nugent listed a three-bedroom, two-bath house here on Jo Ann Drive, offers came immediately, including a $208,000 one from a couple with a young child looking for their first home. A competing bid was too attractive to pass up. American Homes 4 Rent AMH 0.14% a public company that had been scooping up homes in the neighborhood, offered the same amount—but all cash, no inspection required. Twelve hours after the house went on the market in April, the Agoura Hills, Calif.-based real-estate investment trust signed a contract. About a month later, it put the house back on the market, this time for rent, for $1,575 a month. A new breed of homeowners has arrived in this middle-class suburb of Nashville and in many other communities around the country: big investment firms in the business of offering single-family homes for rent. Their appearance has shaken up sales and rental markets and, in some neighborhoods, sparked rent increases. On Jo Ann Drive alone, American Homes 4 Rent owns seven homes, property records indicate. In all of Spring Hill, four firms—American Homes, Colony Starwood Homes , SFR 5.15% Progress Residential and Streetlane Homes—own nearly 700 houses, according to tax rolls. That amounts to about 5% of all the houses in town, a 2016 census indicates, and roughly three-quarters of those available for rent, according to Lisa Wurth, president of the local Realtors’ association. Those four companies and others like them have become big landlords in other Nashville suburbs, and in neighborhoods outside Atlanta, Phoenix and a couple dozen other metropolitan areas. All told, big investors have spent some $40 billion buying about 200,000 houses, renovating them and building rental-management businesses, estimates real-estate research firm Green Street Advisors LLC. Still, they own less than 2% of all U.S. rental homes, according to Green Street. The buying spree amounts to a huge bet that the homeownership rate, which currently is hovering around a five-decade low, will stay low and that rents will continue to rise. The investors also are wagering that many people no longer see owning a home as an essential part of the American dream. 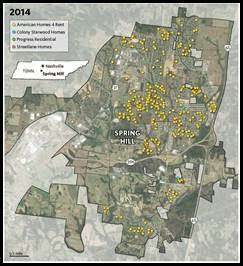 Corporate homeowners in Spring Hill have turned many single-family homes into rentals. For many years, the rental-home business was dominated by small businesses and mom-and-pop investors, most of whom owned just a property or two. Big investment firms concentrated on other real-estate sectors—apartment buildings, office towers, shopping centers and warehouses—reasoning that single-family homes were too difficult to acquire en masse and unwieldy to manage and maintain. That all began to change during the financial crisis a decade ago. Swaths of suburbia were sold on courthouse steps after millions of Americans defaulted on mortgages.Veteran real-estate investors raced to buy tens of thousands of deeply discounted houses, often sight unseen. The big buyers included investors Thomas Barrack Jr. and Barry Sternlicht —who later merged their rental-home holdings to create Colony Starwood— Blackstone Group LP, the world’s largest private-equity firm, and self-storage magnate B. Wayne Hughes, who is behind American Homes. On the first Tuesday of each month during the crisis, investors sent bidders to foreclosure auctions around Atlanta, where the foreclosure rate exceeded 3% in 2011, according to real-estate analytics firm CoreLogic Inc. They toted duffels stuffed with millions of dollars in cashier’s checks made out in various denominations so they wouldn’t have to interrupt their buying sprees with trips to the bank, according to people who participated in the auctions. Similar scenes played out in Phoenix, where the foreclosure rate hit 5% in late 2010, and in Las Vegas, where it nearly reached 10%. The big investors accumulated tens of thousands of houses around those cities and others, including Dallas, Chicago and all over Florida, then got to work sprucing them up to rent. Often, renovations were major. Invitation HomesInc., the company Blackstone created to manage its rental homes and took public in January, says it spent an average of $25,000 fixing up each of the foreclosed homes it bought. A young resident of Spring Hill played ball last month on Cynthia Lane, a street with multiple rental properties. The bulk-buying brought blighted properties back to life and helped speed the recovery of some of the regions hardest hit by the housing crisis. Executives at the investment firms say they offer homes in good school districts to families that may not be able to buy in those neighborhoods because of damaged credit and tighter postcrisis lending standards. One of those firms, Progress Residential, is owned by a private-equity firm formed by Donald Mullen Jr., a former Goldman Sachs Group Inc. mortgage chief who oversaw the bank’s lucrative bet against the housing market a decade ago. Progress now owns about 20,000 houses. On a call with investors earlier this year, Mr. Mullen said Progress was betting that much of the middle class will have to rent if it wants to maintain the suburban lifestyle of the past. He said Progress offers “aspirational living experience” to tenants he described as typically about 38 years old and married, with a child or two, annual income of about $88,000, less-than-stellar FICO credit scores of 665 and $45,000 of debt. “Our residents are quite a ways away from being able to purchase a home,” he said. Home prices in many markets are nearing their 2006 peaks, prompting some investors who bought homes during the downturn to flip them at a profit. But the big buy-to-rent investors are hanging on to their properties and looking to grow. With fewer foreclosure properties available to buy, those firms have devised other ways to accumulate homes, including buying out rivals, building homes themselves, and buying properties one-by-one on the open market. They are focusing on places where they have gained scale through early foreclosure purchases, or around booming cities such as Nashville, Denver and Seattle. Corporate buyers prefer easy-to-maintain newer homes in entry-level price ranges and in neighborhoods governed by homeowners associations. With family renters in mind, they rarely consider anything smaller than a three-bedroom. They prefer easy-to-maintain newer homes in entry-level price ranges and in neighborhoods governed by homeowners associations, which can help look after their properties. They often outfit their homes with the same appliances, fixtures and flooring so that their maintenance crews have parts on hand when they make house calls. They have deep pockets and are dispassionate buyers, paying with cash and never fussing over the carpet or paint color. Spring Hill is about an hour’s drive south of downtown Nashville. It has attracted investors for the same reasons families flock there. It boasts top-rated schools and has been adding jobs at one of the fastest clips in the country. General Motors Co. kick-started the town’s growth in 1990 when it opened a vast plant for its now-defunct Saturn brand. The population has grown from about 1,500 back then to some 36,000 today, with subdivisions covering what had once been farmland. American Homes arrived in 2012, the year after it was founded by Mr. Hughes, now 83 years old, who made billions in the self-storage business, and David Singelyn, who is the company’s chief executive. Mr. Hughes told one of his earliest investors, Alaska’s state oil fund, that he imagined the sort of tenants he wanted—families with school-age children—and then went looking for suitable houses in good school districts. Nashville’s foreclosure rate never exceeded 2%, so American Homes approached a local builder, John Maher, who had been renting unsold homes in his subdivisions. The company bought about 50 homes from him and later paid about $10 million for 42 rental homes in the area from local landlord Bruce McNeilage and his partners. Then it enlisted local brokers to find more. Bruce McNeilage and his partners sold 42 rental homes around Nashville to American Homes 4 Rent. Colony Starwood and Progress followed. The proliferation of rental homes spooked owners in some neighborhoods. A few subdivisions voted on whether cap the number of homes that could be rented, but the proposals failed. “People want to sell their homes to the highest bidder, no matter who it is, and they want to be able to rent their home,” says Jamie Shipley, president of the Wakefield Homeowners Association, which governs a subdivision in which 11% of the homes are owned by institutional investors. Soon after American Homes closed its deal with Mr. McNeilage, the local landlord, it increased rents on some of the properties by hundreds of dollars a month, according to Mr. McNeilage and some of his former tenants. “People who were on month-to-month leases got a real rude awakening,” he says. American Homes, which owns more than 48,000 houses nationwide, controls nearly half of Spring Hill’s rental homes, leaving aggrieved renters limited choices. “If you want to be in that subdivision and have your kids go to that elementary school, you have to deal with them,” Mr. McNeilage says. Jack Corrigan, American Homes’ operations chief, says rent increases for tenants renewing leases average 3% to 3.5%, and the company generally restricts larger hikes to new leases. “We try to be very reasonable with all of our tenants,” he says. When Aaron Waldie moved to Spring Hill for a job in the finance department of a new hospital, he and his wife, Jessica, intended to use profits from selling their California home to buy a new house. Despite offering thousands of dollars above asking prices, the couple lost several bidding wars and settled for a rental owned by Colony Starwood. “It’s a lot more expensive than homeownership,” he said. Aaron Waldie and his wife lost several bidding wars for homes in Spring Hill before settling for a rental. To assess how rents sought by Spring Hill’s big four corporate owners compare with the monthly costs of owning the same properties, The Wall Street Journal analyzed information from the companies’ marketing materials and county sales records for 27 homes purchased by the four since the beginning of March. The analysis—which assumed 10% down payments and 30-year fixed-rate mortgages, plus taxes and insurance—found the posted rents on those homes averaged 32% more than the monthly ownership cost. The average rent for 148 single-family homes in Spring Hill owned by the big four landlords was about $1,773 a month, according to online listings since early May viewed by the Journal. Other landlords also have raised rents, local brokers say. At a recent conference in New York, Mr. Singelyn, the American Homes CEO, told investors that the average household income declared by those applying to rent from American Homes had risen to $91,000, from $86,000 a year earlier. When rents are significantly higher than the cost of ownership, renters tend to become house hunters. Builders who were sidelined during the recession are rushing to catch up to demand. Spring Hill issued more than 1,100 residential building permits for single-family homes since 2015, and over the past year its planning commission has rezoned and subdivided properties to accommodate thousands more, according to municipal records. David Bowater, with his fiancée, Alexa Callanan, says rent increases on their townhouse in Spring Hill prompted them to buy a house in Columbia, Tenn.
David Bowater and his fiancée were priced out of Spring Hill when the rent on their two-bedroom townhouse rose to about $1,100, from $875, over four years. “It’s cheaper to buy at this point,” Mr. Bowater says. After bidding on six homes, they won the seventh. The house is even deeper into the middle Tennessee countryside and farther from the restaurants where they work. Mr. Bowater says it is costing him about $100 a month more to own the home than he was paying in rent on the townhouse, but that it is far cheaper than it would be to rent a comparable home with a yard.